A dense, slow-moving crowd of back-packs, baskets, shopping trolleys, along with wide-eyed, camera-wielding tourists, weaves through the narrow aisles and mills around the chain of stalls stacked with colourful produce. The air is heavy with tantalising smells. The shrill cries of the touts rise above the hubbub of chatter, the distant beat of a busker’s drum, the intermittent roar of a train and the constant rumble of traffic. There was a market here in Southwark, just south of London Bridge, at the time of the Roman conquest in the 5th century. It survived the subsequent invasion by the Norsemen, who burned down the bridge. After the arrival of King Canute in 1014AD, the bridge was reconstructed and the market re-installed. By the 13th century, however, it had begun to cause access problems and was ousted. After several re-locations, The market found a home at the meeting point of all the roads from the South Coast into the city of London. Merchants from all over London traded their produce there and travellers stopped there to stock up and eat before resuming their journeys. This was the beginning of Borough Market’s international fame. By the 18th century, with the industrial revolution, the Southwark skyline was a forest of factory chimneys and its roads were congested with traffic. The market, in its central location was major obstruction. In 1754, it was demolished and re-located to the present site which since has proved perfect for the sale of produce arriving at the Pool of London and at London Bridge Railway Station. Today, Borough Market is administered by a Trust composed of local residents. It is a centre for food excellence and attracts customers from all over London and tourists from all over the world. 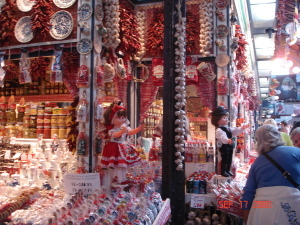 Merchants come from all over England and Europe to sell their produce. Delicious local fruit, fish, meat, milk, cider, beer, fruit juices and preserves take their place alongside olives, olive oil, pasta and sauces from Italy, cheese, wine and bread from France, a thousand and one wursts from Germany, and oranges from Spain and Portugal. It is still totally dedicated to food and drink. The only things on sale which are not edible or drinkable are charming plates, bowls, cups, glasses, tea-towels, oven cloths, aprons and mouth-watering pictures of food. 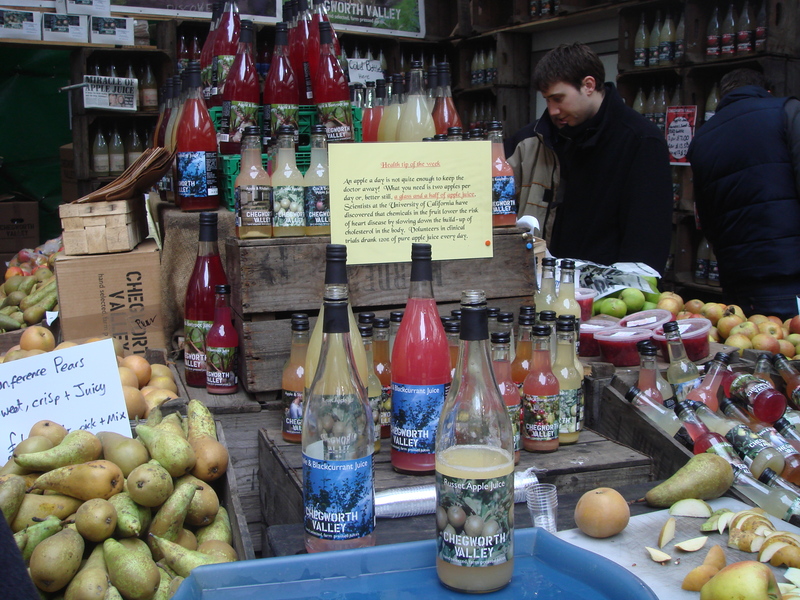 Borough Market has recently celebrated 250 years of trading on its current site. Although threatened by a plan to extend London Bridge Railway Station, the Trust and the local residents are determined to see it survive another 200 years of trading.